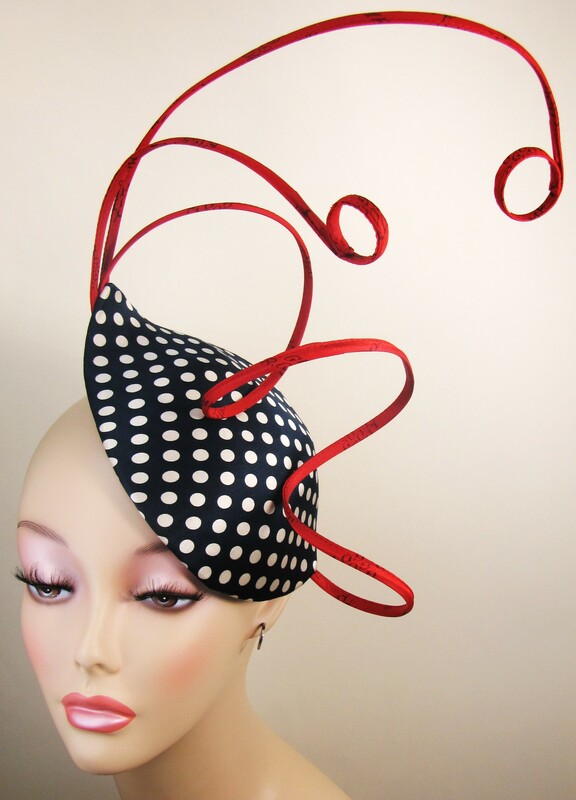 My hats can now be found at a gallery/store called Fine Arts Optical in San Francisco, CA. They are located at 888 Valencia Street. 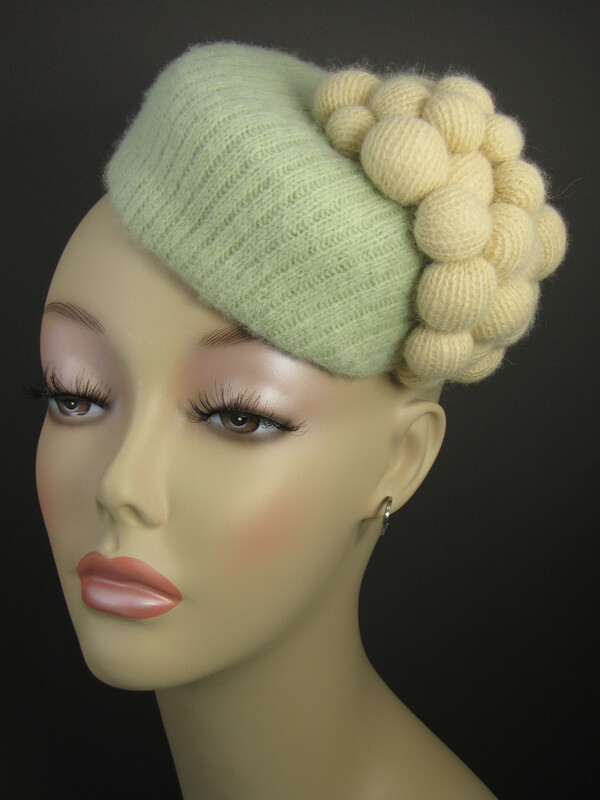 Currently the gallery is featuring hats made out of wool felt. Here are a few of my hats that can be found at the gallery. Enjoy! I love blocking wool felt. It is easy to work with and I especially enjoy making free-form shapes. 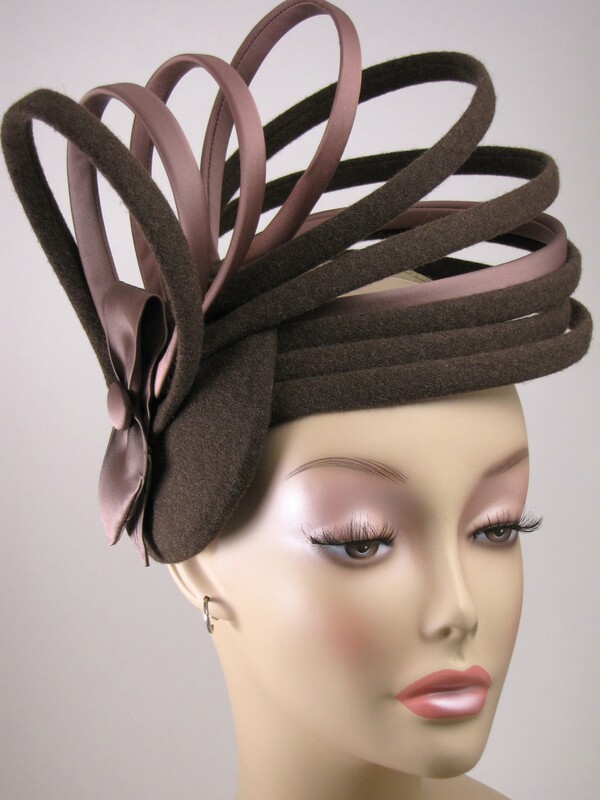 For this I use a plain wooden head block and form pleats and tucks in the wool felt. I let it dry to shape and then I usually go back and stitch the shapes I have made so they hold. 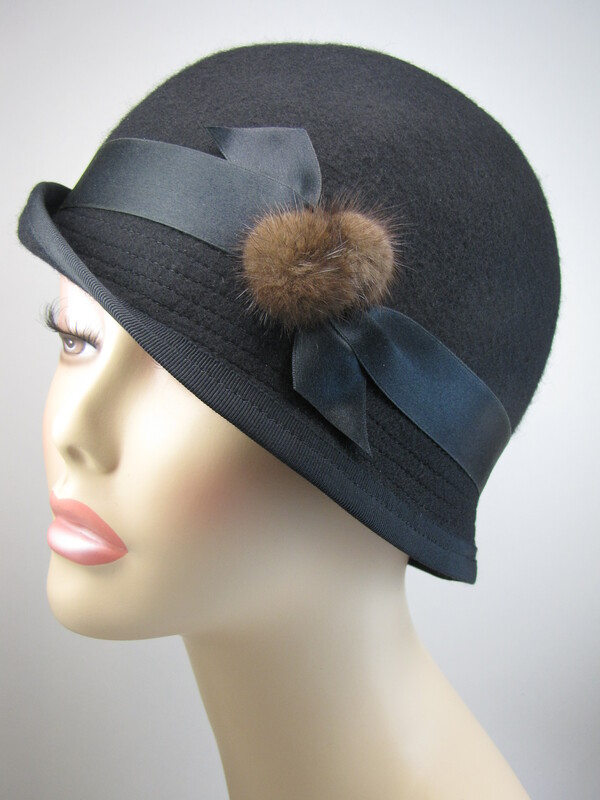 All my wool felt hats are lined with a soft cotton twill and a Petersham ribbon band. 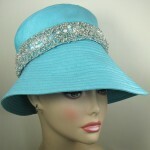 The hats pictured are two of my favorites! It’s time again for the Discarded to Divine show in San Francisco. This event is put on by the St. Vincent de Paul Society of San Francisco. Designers are invited to spend a day digging through the donation bins in order to find garments and textiles that can be used to create a new fashion item. Once the item is created it is given back to the St. Vincent de Paul to be auctioned off at their Discarded to Divine show. The event is filled with great fashion and food. The best part is checking out all of the items that have been created using recycled garments and fabric. All the money raised is used to help the homeless and needy of San Francisco. For more information check out their website. www.discardedtodivine.org. 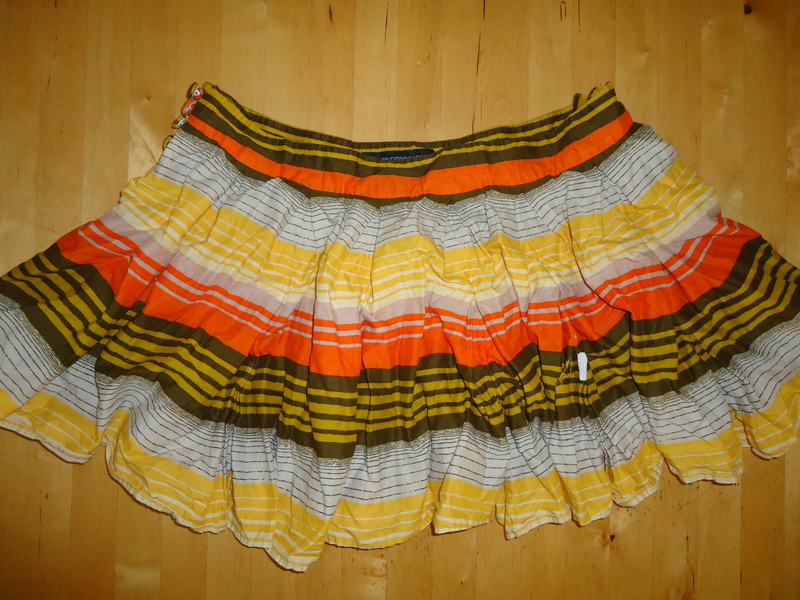 This year I used a stripe skirt that I found. I turned the stripes and used them vertically in my hat. 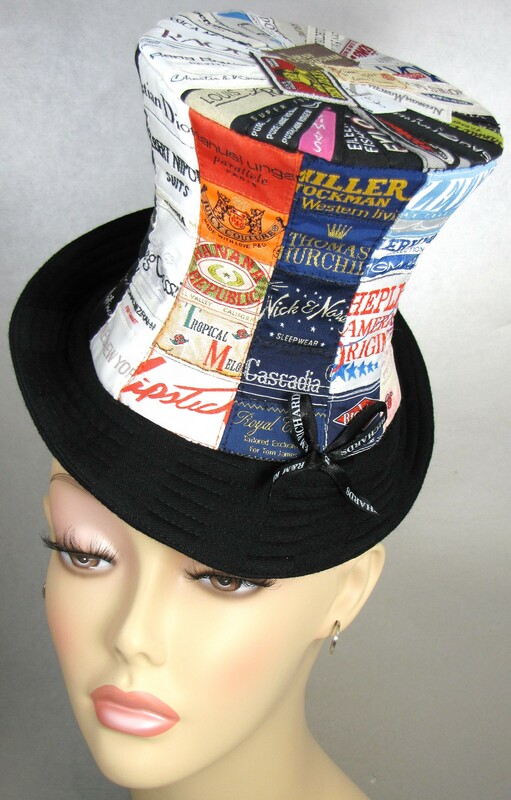 My hat is a tall top hat with 10 panels in the crown. 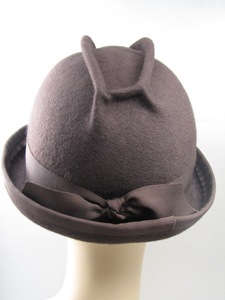 The interior of the hat is built using stiff buckram and sewable boning to help the hat hold it’s shape. 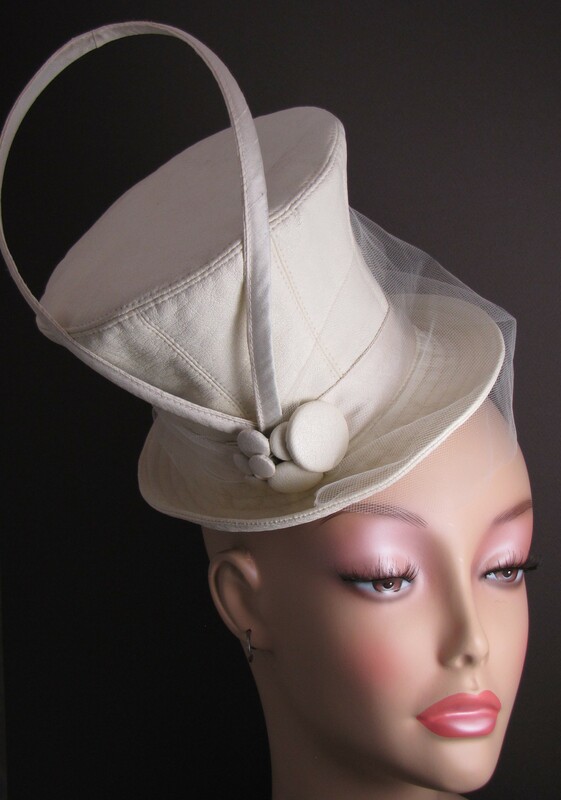 The trim piece uses sewable boning and millinery wire. I finished off the ends of the trim piece using the self fabric button loops that I found on the skirt. In April I participated in the 6th annual Discarded to Divine show that is put on by the St. Vincent de Paul of San Francisco. The St. Vincent de Paul invites designers to visit their warehouse of discarded items and pick out and cart home whatever looks interesting. Each designer creates fashions that are then donated back to the SVdP to be auctioned off at their annual fashion show. I created three hats for the show using a girl’s party dress, a discarded wool coat, a pair of pants, and the sleeves of a San Jose Sharks sport jacket. The entire event was amazing and the garments and accessories were incredible. 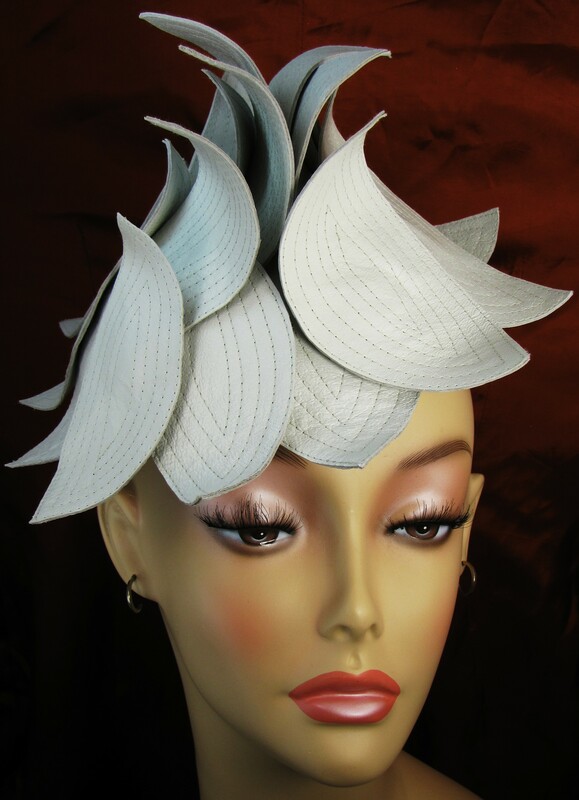 I was really thrilled that my Winter White Top hat won the juried category of fashion accessories-other and the people’s choice award for best design in women’s accessories. I am really looking forward to next year’s event! Each hat pictured above was created from a garment or garments that I found at the St. Vincent de Paul warehouse. 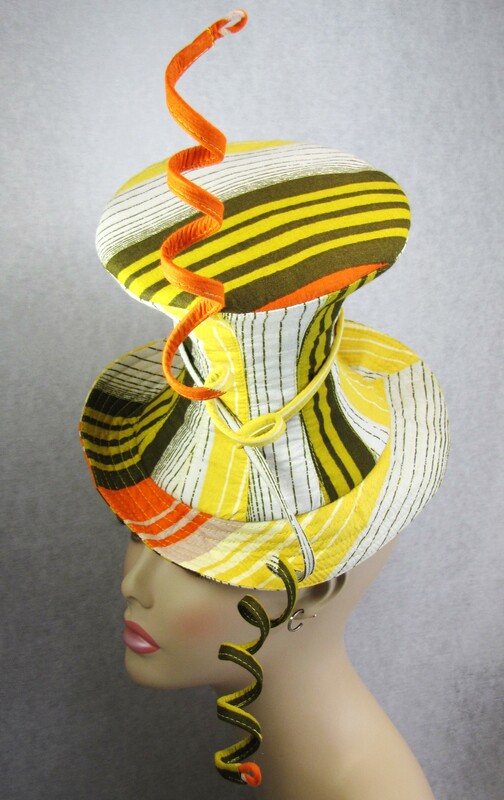 This residency really pushed me out of my comfort zone as a designer and I am really pleased with each and every hat. 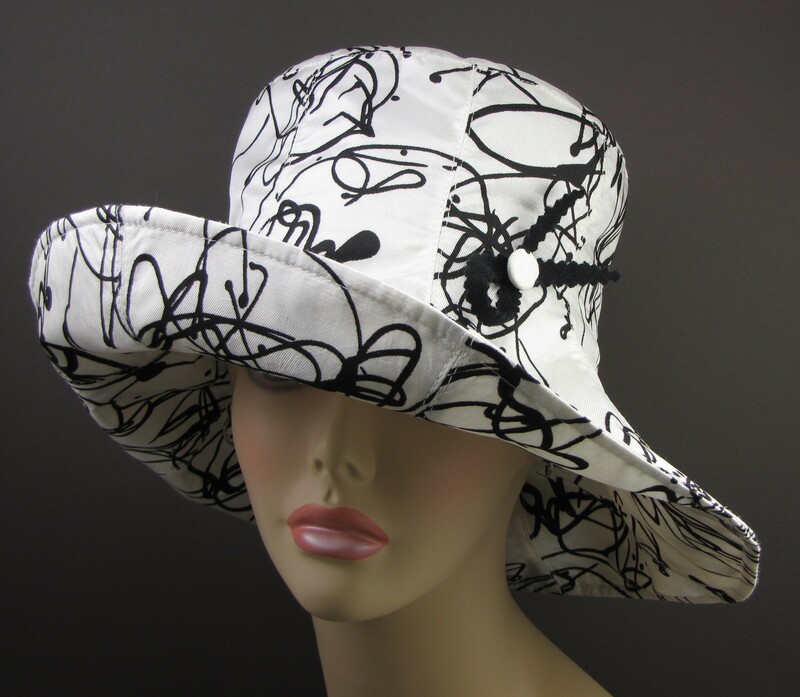 I plan to continue making hats out of found and recyled clothing. I enjoy the challenge of the limited fabric that each garment presents and the idea that almost any garment can be made into something new! Enjoy! My Fashion Artist in Residency at the St. Vincent de Paul is rolling along smoothly. I am finding so many great things in the donation bins that I am overwhelmed with the amount of materials to work with! The picture above is one of my creations. This was made from a vintage dress that I found. It had a satin top with a tweed skirt. I think it is from the 1950′s, give or take a few years. I turned it into a lovely fascinator. I saved the bow from the dress and used it to finish off my piece. I am so honored to have been chosen as the 2011 Fashion Artist in Residence by the St. Vincent de Paul, Alameda County. The St. Vincent de Paul has a great program that allows fashion designers to use donated clothing and household items to create a fashion line. The point of this program is to promote recycling and reuse. 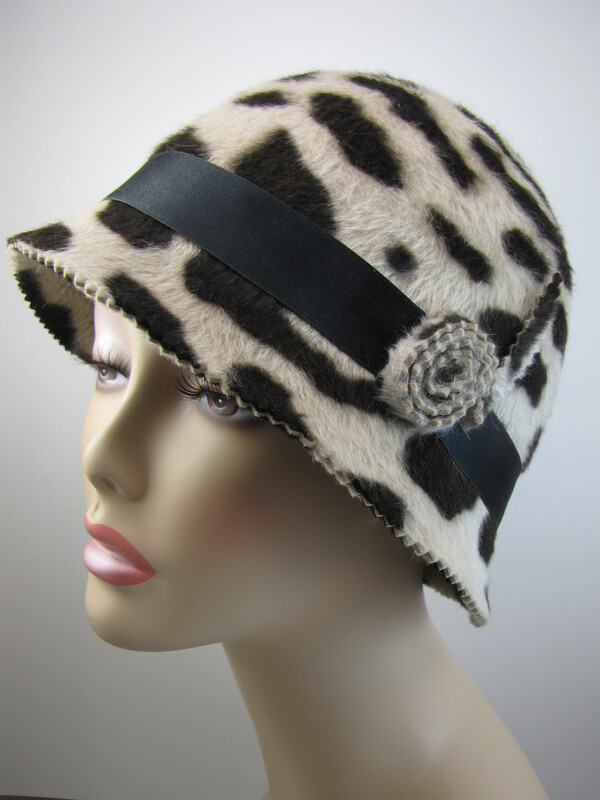 I will be making a line of hats from the items that I find in the St. Vincent de Paul warehouse. 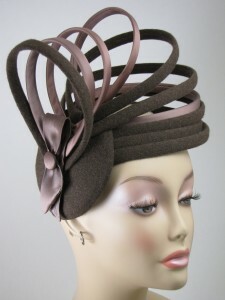 Once my hats begin to take shape I will post some pictures. 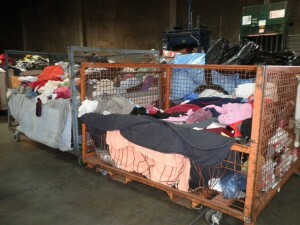 I have included a picture above of a couple of the large bins of donated clothing in the St. Vincent de Paul warehouse. I have been spending a large amount of time digging through these bins looking for pieces of clothing that I can cut up and use for my hats. I have come across some really great things! 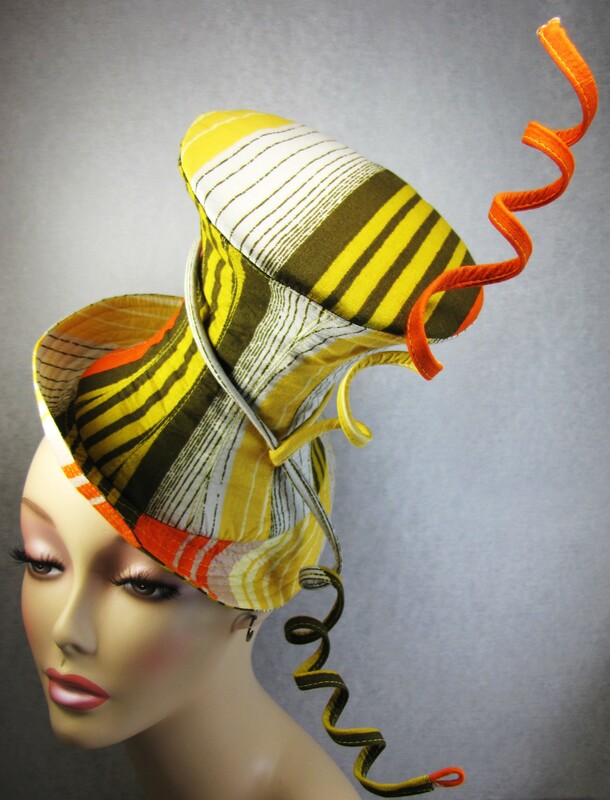 I recently entered a wearable art competition. The wearable art show and competition is put on by the Port Moody Art Centre in Port Moody, BC. You can find more information on their website, www.wearableartawards.com. 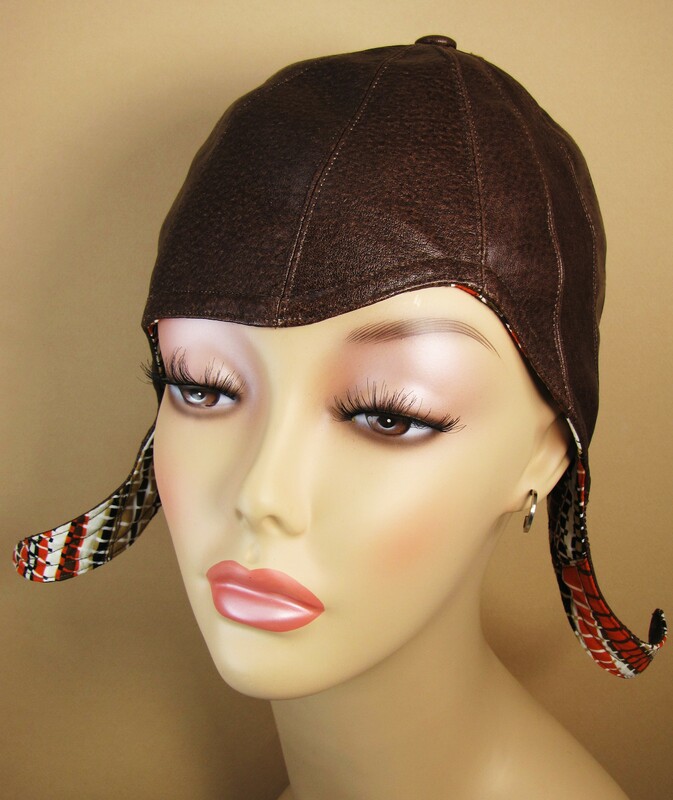 I made the hat above for the headress category. In addition, there was a special category using paper. I made a paper mache base that is head shaped. 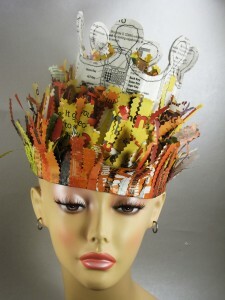 The hair is made from cut up newspaper. The crown is made from a discarded cell phone manual. 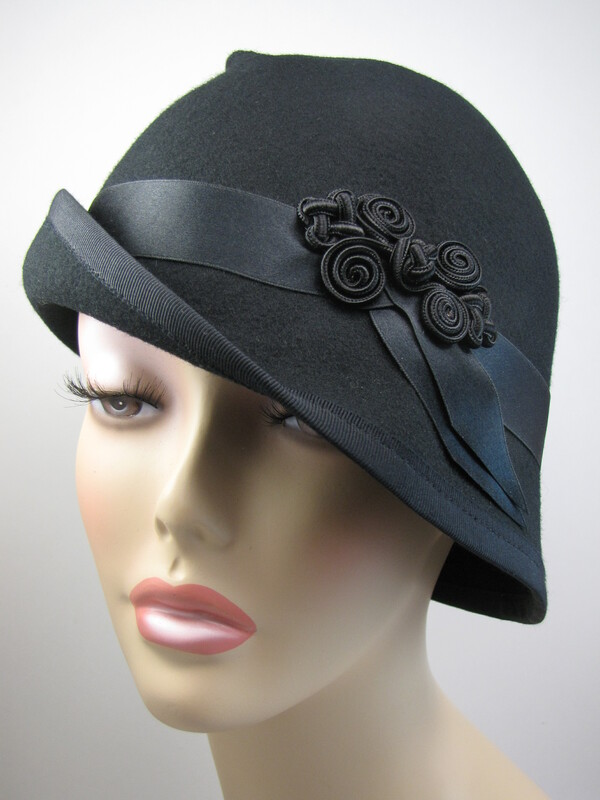 The hat is lined in my signature black cotton twill. I was excited to learn that my piece was accepted into their show that takes place on February 19th and 20th, 2011 in Port Moody, BC. In May I was invited to attend a Kentucky Derby Party. There was a best hat competition at the party so the pressure was on! Three of my friends also attended the party so I made a hat for each of us. On the day of the party my friends were thrilled with their hats! The brown and green hat won the hat competition.